The new "We Light a Candle" CDs will be available soon... and you can order a CD in advance now, or get a digital download right away! Thank you for supporting the Heroes Project! Choose an option below to make a donation and get a download of the song or have the CD shipped to you. 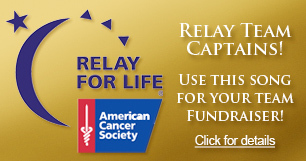 Select the Donor or Hero level to show your support for our Heroes with an increased donation. You’ll also be able to donate to the Heroes Project from your shopping cart as you check out. 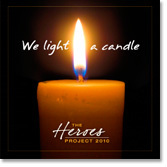 Show your support by increasing your donation to $7.50 for The Heroes Project! Show your support by increasing your donation to $10 for The Heroes Project! Your CD will be shipped via USPS. Please allow 2-4 weeks for shipping and handling. 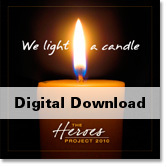 Show your support by increasing your donation to $7.50 for The Heroes Project! Your CD will be shipped via USPS. Please allow 2-4 weeks for shipping and handling. Show your support by increasing your donation to $10 for The Heroes Project! Your CD will be shipped via USPS. Please allow 2-4 weeks for shipping and handling. Your download will include three Heroes tracks -- the full vocal version performed by Rachel Farley, a background track and an instrumental version. Show your support by increasing your donation to $7.50 for The Heroes Project! Enjoy all three Heroes song tracks on your download. Show your support by increasing your donation to $10 for The Heroes Project! Your download will include all three Heroes song tracks. Your CD will include three Heroes tracks -- the full vocal version performed by Rachel Farley, a background track and an instrumental version. Your CD will be shipped via USPS. Please allow 2-4 weeks for shipping and handling. 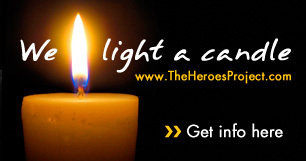 Show your support by increasing your donation to $7.50 for The Heroes Project! 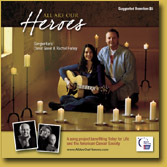 Enjoy all three Heroes song tracks on your CD. Your CD will be shipped via USPS. Please allow 2-4 weeks for shipping and handling. Show your support by increasing your donation to $10 for The Heroes Project! Your CD will include all three Heroes song tracks. Your CD will be shipped via USPS. Please allow 2-4 weeks for shipping and handling.